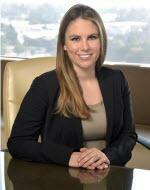 Kristen Erney is a civil litigation attorney with experience focused on litigating complex cases in the areas of general liability, premises liability, and construction defect litigation. She specializes in the defense of developers and general contractors in complex residential and commercial construction defect matters. She has experience representing clients at all stages of claims, from successfully resolving claims pre-litigation through trial. She graduated from the University of Southern California with Bachelors of Arts degrees in Political Science and Religious Studies. In 2012, she earned her Juris Doctorate from Pepperdine University School of Law where she was a Dean's Merit Scholar.